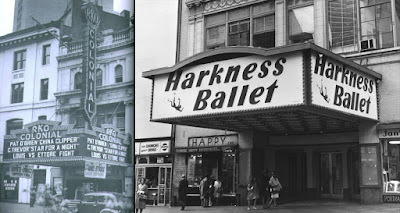 There are several Manhattan theaters linked to Houdini history: the Hippodrome, the Palace, the Times Square, and Tony Pastor's. 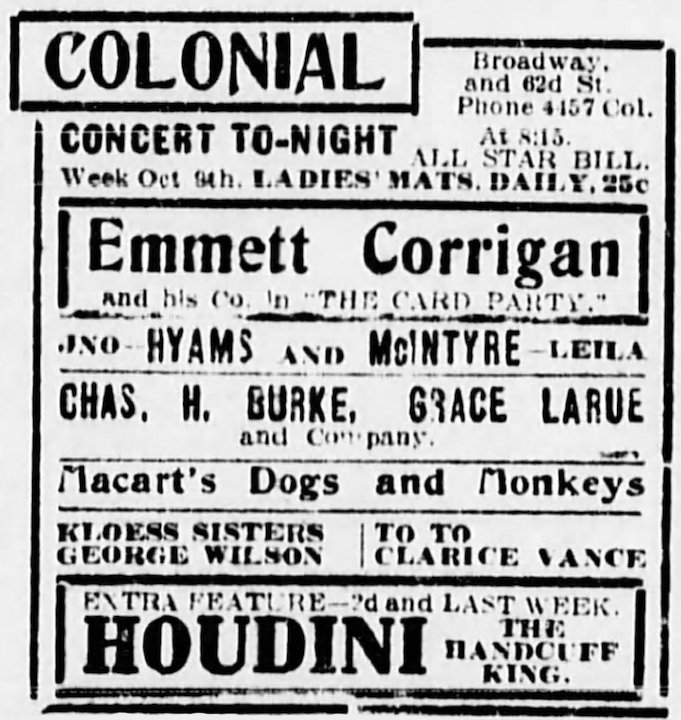 But you'll rarely hear the Colonial mentioned among these, even though it played a significant, but now largely forgotten, role in Houdini's career. So let's tell the story! After Houdini played his first successful season on the Keith and Orpheum vaudeville circuits in 1899 and early 1900, he went to Europe. The plan was for him to stay for six months, and then return with a boosted reputation that came with a European tour. But he was so successful that he remained in Europe for a remarkable five years. In his absence, a proliferation of "Handcuffs Kings" sprung up in his place. In 1905, Houdini resolved to come home and conquer America. But after so many years, would America be interested in, or even remember, the original Handcuff King? Harry Houdini, "the Handcuff King," who returned from Europe three weeks ago, had decided to accept the extremely liberal offers made him by American vaudeville managers. He will rest until October 1, when he will begin his American vaudeville tour. Houdini releases himself from handcuffs, leg shackles, etc. This wonderful performance will be seen at Keith's during the winter season. It's no surprise to see Keith's mentioned here. Houdini's former manager Martin Beck was partnered with B.F. Keith, and their Keith-Orpheum circuit defined big time American vaudeville. So which of the many Keith's theaters would usher in Houdini's triumphant return? Surprisingly, none. 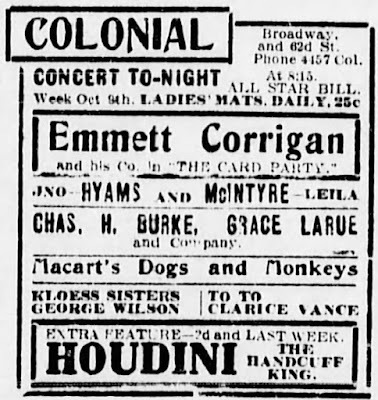 Instead, Houdini decided to play his first dates at the independently owned Colonial Theater on 1887 Broadway near 62nd Street in New York City. The Colonial was a new theater to Broadway. It had opened on February 8, 1905, and was designed in the style of a Victorian London music hall. It was creation of Fred Thompson and Elmer Dundy, the same duo behind the Hippodrome and Coney Island's Luna Park. But within two months of its opening, Thompson and Dundy sold the theater to Percy Williams, who dropped the "Music Hall" theme and ran it as a straight vaudeville house. It was Williams who landed Houdini's return. The theater proudly promoted this "Important Engagement." In the week proceeding his U.S. opening, Houdini made two PR stumbles. An attempt to expose rival Handcuff King, Cunning, in a Harlem theater, had led to a brawl and the arrest of Hardeen. The press sided with Cunning against the "foreign looking" interlopers. Houdini then challenged another rival, Boudini, to an underwater handcuff escape contest off Battery Park. But the few New York papers that covered the contest smelled a set-up and reported as much. 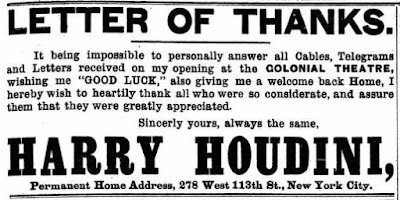 So Houdini was not going into his Colonial engagement riding a wave a of glowing press, and the theater itself was not known for giving performers a break. In one way, it was the toughest spot in town. Although vaudeville, growing respectable, had lured the family trade, there were rough elements in Little Old New York who de- lighted in rattling the performers and, if antagonized, doing everything short of ripping up the seats. Monday matinee at the Colonial was a nightmare to vaudevillians, even those who could "josh" a music hall audience into a good humor. At this lush palace of entertainment was born a tactic of audience-displeasure which has persisted to the present day at ball parks and fight arenas—the "Colonial clap." This was applause de- signed to rattle and "break up" the actors onstage by its maddening, mocking rhythm: clap, clap, clap-clap-clap. On opening night, according to Gresham, Houdini marched out onstage to the stirring Kaiser Frederic March "his chin held in, his gray-blue eyes staring directly ahead." He performed a straitjacket escape and then accepted handcuff challenges. This was basically the same act he had performed five years early on Broadway when Bess became disastrously stuck in the Metamorphosis trunk. A repeat of that certainly would have brought on the "Colonial clap." But Houdini's act, honed in Europe, delivered. 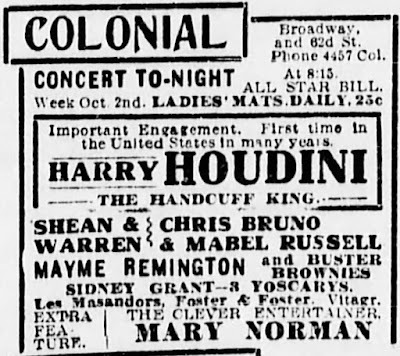 So successful had Harry Houdini, the "Handcuff King," proved as a magnet art the Colonial Theater during the week just closed that Percey Williams has retained the lock picking specialist as the headliner of the Colonial bill for another week. Challenged as he is at every performance by spectators skeptical of the legitimacy of his feats of handcuff elusion, Houdini has thus far in every instance succeeded in escaping from the manacles, shackles and other locks with which volunteers have sought to imprison him. 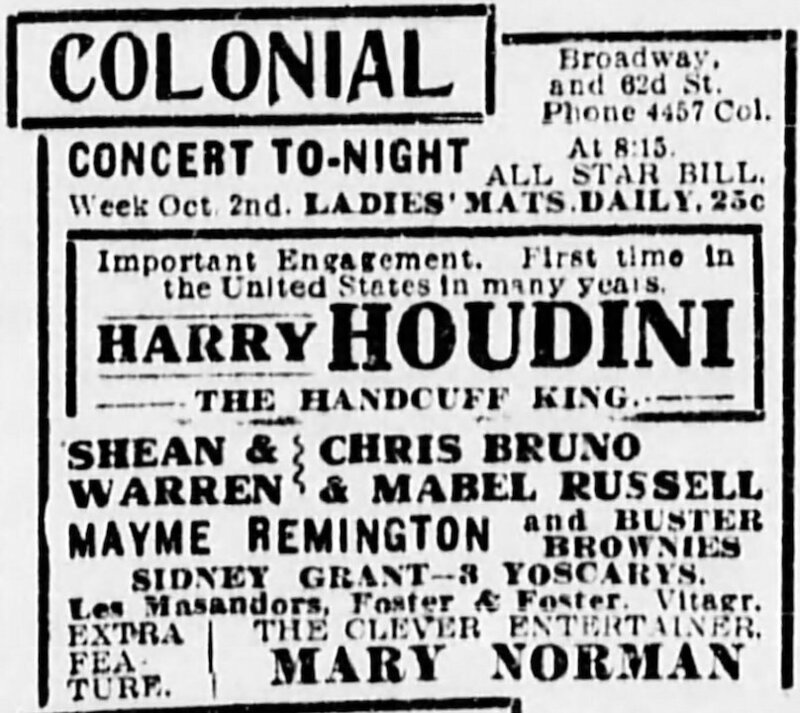 For his second week, the Colonial billing dropped "Harry" and featured him as just HOUDINI. Following his second successful week, Houdini set out on the Keith-Orpheum circuit. His escape from the United States Jail in January 1906 firmly established him as an American superstar. It does not appear he ever played the Colonial again. 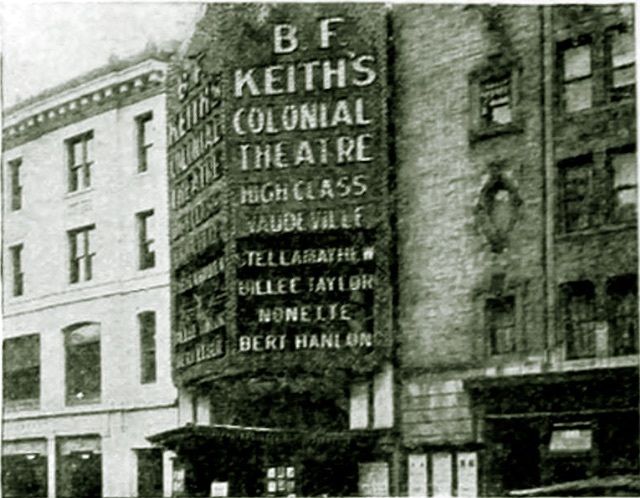 In 1912, B.F. Keith took over the theater, altering its name to Keith's Colonial Theatre. When E.F. Albee took over from Keith five years later, it became the New Colonial Theatre. In 1923, a show at the New Colonial called Runnin' Wild introduced the dance craze called the Charleston to America. In 1932, RKO took over the theater and began showing movies. NBC purchased it in 1956 and converted it into one of their New York television studios (Show of Shows was taped here). A decade later, ABC used the Colonial studio mainly for taping game shows. The last owner was Rebecca Harkness, who in 1971 sunk $5 million into renovating the theatre for her ballet company (it went broke after one season). 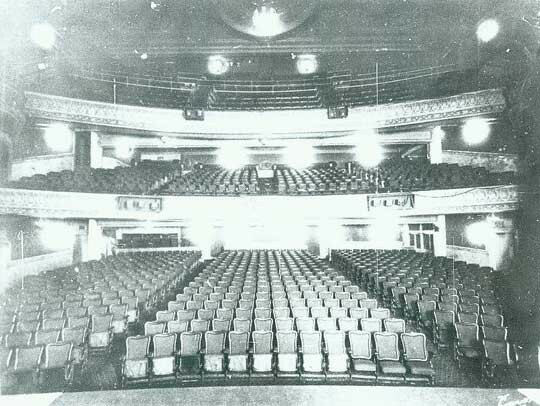 There were a few Broadway bookings in the mid-1970s, after which the building was sold off to a developer and demolished in 1977. Today the location of the Colonial is a condominium tower with a public atrium (the David Rubinstein Atrium at Lincoln Center). Certainly this is now a worthy stop on any tour of Houdini's New York; the site of Houdini's triumphant U.S. return. UPDATE: I recently came upon this letter of thanks Houdini published in the October 14, 1905 issue of the New York Clipper following his Colonial engagement. This is wonderful detective work, John. Thank you for sharing. I will visit the site soon as it's right by my gym! Thanks. This is one of the many bits of HH history that jumped out at me while doing my chronology. So many cool finds that are fun to dig into. More to come. Houdini's office inside 278 is finally FOUND!